Need More Insulation in Columbus, Ohio? Get an Attic Energy Inspection for Only $89! Are your heating and air conditioning bills unusually high? Insulation could be a factor, especially if your home is not properly insulated. When was the last time you checked? If it’s been at least five years, ask the professionals at Muth & Company to perform an energy efficiency inspection of your attic right away. For just $89, our team will perform a thorough inspection and hand you a complete report, including recommendations for the kind of insulation Columbus, Ohio, area residents need. Plus, if we recommend repairs or new insulation products, we’ll apply a portion of the $89 inspection toward any attic-related work, within 30 days of your inspection. Here’s what Muth & Company will do for your attic. Insulating your attic with the proper type and amount of insulation accomplishes two important tasks: it helps keep you and your family warm all winter and cooler all summer, and attic insulation can help reduce your energy expenditures. As heat rises in your home, it naturally moves to cooler areas and places where temperature differences are measurable. By insulating your attic spaces, you provide resistance to heat flow ensuring that heated or cooled air remains in the interior and isn’t escaping through your ceiling and roof. The U.S. Department of Energy (DOE) estimates that a typical home loses 44% of its energy through poorly insulated walls and ceilings. Stopping that flow of energy can reduce your energy usage and lower your monthly heating and cooling bills. 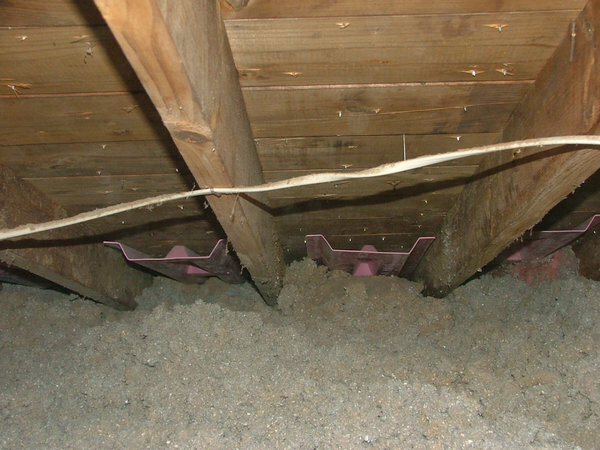 Many older homes have inadequate levels of attic insulation, usually only 3-6 inches, and many newer homes have only standard levels, which fall below most new building codes. If your home is more than 10 years old, it is almost certain that your attic insulation is inadequate. While most people are familiar with “batt” insulation that is rolled out, the blown-in insulation installed by Muth & Company Roofing is more effective at providing improved R-value. This type of insulation is ideal for older homes because it can be blown into the attics and walls without damaging the home. Do you trust “anybody” to go into your attic? Select the company that knows all about insulation and how to save you money over the long term. Muth & Company Roofing is your go-to specialist for the kind of insulation Columbus, Ohio, area homes need. Get a Free Estimate for Insulation Today! For only $89, get the immediate satisfaction of knowing whether your home is properly insulated. It could save you a lot more in the long run. Call (614) 682-3060 to schedule a complete Columbus attic insulation inspection today.